Release of the New Σ-G5S II Premium Modular Mounter, Rotary head design for a “1-head solution” with both high speed and versatility Improves productivity by approx. 20% with mounting speed of 90,000 CPH - News Releases | Yamaha Motor Co., Ltd.
IWATA, January 11, 2018—Yamaha Motor Co., Ltd. (Tokyo: 7272) announces the April 1, 2018 release of the new Σ-G5S II, a surface mounter model that further improves upon the Σ-G5S premium modular mounter that achieved both high speed and versatility, and caters to various components with its rotary head design based on our “1-head solution” concept. 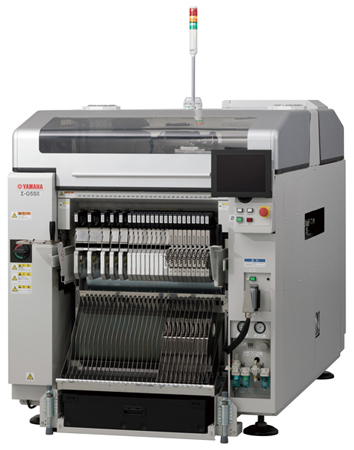 The Σ-G5S II retains all the features of its predecessor, including the high-speed high-accuracy rotary direct-drive head, the overdrive motion for highly efficient production by picking up components from either the front or rear feeder on the machine, and the Super Loading (SL) feeder that facilitates splicing-less*1 component supply. It also gains new head designs, an improved PCB feeding sequence, an enlarged internal buffer size for feeding larger PCBs and more to improve productivity. Additionally, its mounting speed of 90,000 CPH*2 (under optimum conditions)*3 represents an improvement of approximately 20% compared to the Σ-G5S. Quality has also been improved by extending the detection range of components held by the mounter to immediately before placement. In addition, reliability has been further enhanced due to better balance for the beam motors to bolster stability, lower internal temperature by improving cooling performance, extending the service life of important components like the high-speed multi-purpose head and more. The Σ-G5S II will be on display at the 47th Internepcon Japan electronics manufacturing and mounting technology exhibition to be held at the Tokyo Big Sight (Koto-ku, Tokyo) from January 17 to 19, 2018. *1: Eliminates the need to splice new tape to the existing tape being used when feeding components into the tape feeder, the device feeding electrical components. In recent years, various products including household appliances, personal computers and mobile phones have become more compact, denser and with greater functionality and diversity. Moreover, their lifecycles have become increasingly shorter. Consequently, the mounting process for the electronic components in these products has seen calls for higher speeds, but also the flexibility to efficiently accommodate wide variations in component types and quantity as well as handle mass production on the same production line. However, head replacement has caused a number of major issues including production downtime during replacement and investment loss from the need to purchase and store spare replacement heads. In addition, if there was even one large component that needed to be mounted on a PCB, the manufacturer could not use high-speed mounting for small components and would have to replace the head with a low-speed multi-purpose head. This resulted in critical disadvantages such as losses in efficiency due to reduced throughput and/or bottlenecking. The Σ-G5S II premium modular mounter is based on the Σ-G5S, which has been highly regarded for its “1-head solution” using a rotary head that achieves both high speed and versatility without the need for head replacement to cater to a wide variety of components. The Σ-G5S II adopts new head designs and other features to further improve productivity and supports super-small 0201 (0.25 × 0.125 mm) size components. Both the high-speed multi-purpose head and multi-functional head have been further enhanced in pursuit of Yamaha’s “1-head solution” concept to accommodate a wide range of components without the need for replacing heads while maintaining high-speed operation. High-speed multi-purpose head with extended life: While the nozzle count remains at 15, due to weight reductions and higher output from the direct-drive motor, mounting capacity per head has increased by approx. 20% to 45,000 CPH (under optimum conditions) compared to the Σ-G5S. At the same time, the Σ-G5S II has the versatility to handle a wide range of component sizes, from super-small 0201 size components to larger L44×W44×H12.7 mm components. Important parts like brushless slip rings and high-rigidity couplings have been reengineered to offer longer service life and improve reliability. Multi-functional head: In addition to increasing the number of nozzles to three, the frame rigidity has been increased to boost mounting capacity per head by approx. 20% to 10,800 CPH (under optimal conditions) compared to the Σ-G5S. The Σ-G5S II accommodates a wide range of components, whether large or irregular in shape, from 1005 (1.0 × 0.5 mm) size components to L72×W72×H25.4 mm components, as well as connectors as large as 150×26 mm. Previously, detection of held components was limited from pick-up to component recognition, but now extends to immediately before placement. The high-speed multi-purpose head uses a side-view recognition camera to track components and identify them, and allows the operator to select from three detection timing modes (for high-speed nozzle components): 1) arrival on PCB, 2) during placement operations, or 3) immediately before placement. The multi-functional head uses nozzle flow rate to detect holding state from after component recognition to immediately before placement (not applicable to some parts sized L5×W5 mm or smaller). By improving the feeding sequence, PCB feeding time has been reduced from 2.0 seconds to 1.8 seconds. In addition, PCBs can now be put on stand-by across mounting areas and the buffer space in front of the placement area has been increased from 280 mm to 410 mm. Feed time is up to 55% shorter than with the Σ-G5S, thereby improving productivity with the applicable large PCBs. The load subjected to the left and right motors when the beam is being driven has been balanced by changing the cable positioning and more. This suppresses motor heat buildup to reduce device deformation and vibration. Improved cooling performance also reduces the mounter’s internal temperatures. This not only helps stabilize machine accuracy, but also extends the service life of hardware components. The Σ-G5S II is compatible with the main optional features available for the Σ-G5S, such as the nozzles, tape feeder, trolley and nozzle stocker replacement parts. Clients already using the Σ-G5S can purchase the Σ-G5S II with the confidence that they can continue to use their current assets.